Update Oct. 5, 2017 – Looks like Amazon has received all the applications it needs for now, and the job has been taken down. For more jobs like this, check our Newest Jobs & Gigs page. And don’t miss the next Amazon job posting — just like our Facebook page and check your feed for our posts. May you be rocking your Rebellion soon! ***Short-Fuse Alert – These jobs usually go fast, so apply or share quickly if interested! Amazon just announced hiring again for Seasonal Customer Service Associates. These are full-time positions at $10/hr., plus a bonus opportunity, with paid virtual training. You’ll be helping Amazon customers via phone and chat. Our Facebook members hired for the job report that a Chromebook and headset are provided. The positions may last up to six months. “There may be opportunities for regular long term employment,” the company adds. Employees give Amazon 3.5 stars out of 5 on Glassdoor. Reviews on Indeed give the company 3.7 stars out of 5. Alabama, Arkansas, Georgia, Idaho, Kansas, Kentucky, Louisiana, Mississippi, Nebraska, New Mexico, North Carolina, Oklahoma, South Dakota, South Carolina, Tennessee, Utah and West Virginia. *If your state isn’t included, see our Newest Jobs & Gigs page for more jobs like these. “I applied for this position at the end of June and heard back at the end of August. Due to my degree and experience, I was not required to do any type of interview. I received an email inviting me to a ‘hiring event’ which was a WebEx online meeting room with the presenter going over the particulars of the job. All you do is listen, you do not speak or participate. If you get to this step you are hired. “Afterwards you will get an email to submit your background check and complete the new hire paperwork. The I-9 has to be completed partially online (just the part with your contact info) and submitted via either an in person Amazon office or a local business that has contracted to provide the service-they need to see your documents. My location was 20 miles away. “After completing the I-9 form, I got an email that allowed me to pick my post training schedule from among several. They were all 2nd shift schedules (not sure if this changes). Training is 4 weeks and mine is from 10a-7p Eastern. They will send out emails a couple times of week during the hiring process to remind you of steps you need to complete. “I attended another [Amazon] hiring event and it was WAY different than the last one. It was pretty cool, lots of info and they said they are not doing interviews. They are fast tracking people who did well on the assessment, straight into giving them an offer for employment. It’s a 3-6 month contract, with potential for overtime. “They DO Offer benefits, but you have to work for 90 days before you can get benefits. I was offered the position officially, however I will be declining it because they said the pay does *NOT* Change from $10 an hour once you completed training – unless you are in a state that the min wage is higher than $10/hr. To go straight to the job listing, click here. For more jobs like these, check our Newest Jobs & Gigs page. To be the first to hear about jobs like these, like our Facebook page and check your feed for our posts. May you be working from home soon! 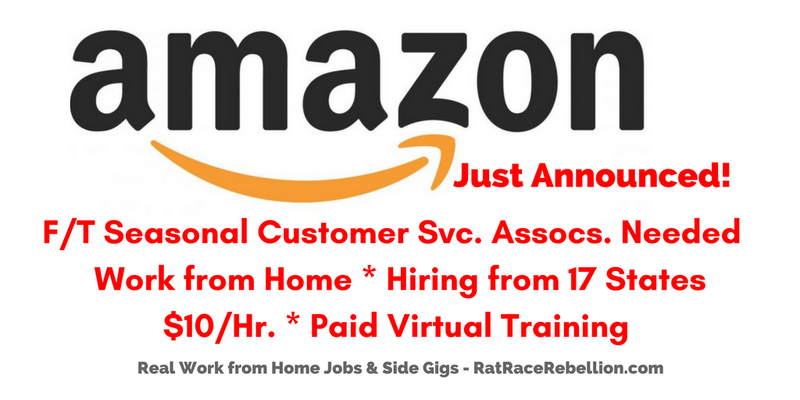 This entry was posted in Customer Service Jobs, Work at Home Jobs and tagged Amazon. Bookmark the permalink.